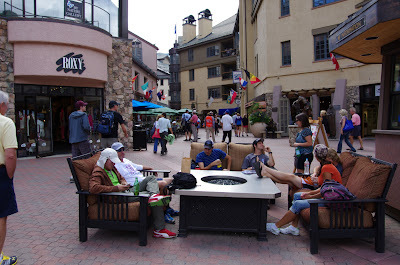 Today it is time to plan out the day at the race for Stage 4 finish into the ski resort of Beaver Creek. 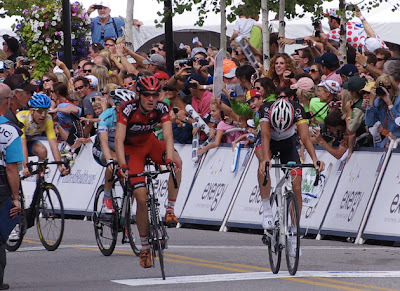 Now last year I had a great time at the USA Pro Challenge in Beaver Creek, in fact, I think it may have been my favorite stage of 2012. I liked the mood up the mountain; it was clear that anyone who had made their way this far was there to see a bike race. Of all the host cities, the fans seemed to be most playful and in good spirits in Beaver Creek. 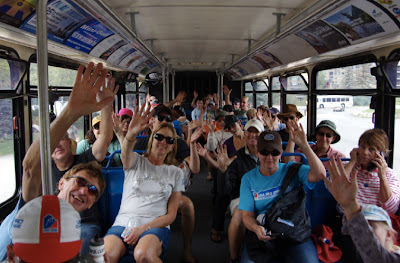 This year I plan to go back, not only because they will be serving fresh hot cookies at 3:00pm - a tradition for the ski resort - but because I enjoyed riding the bus up the hill from the free public parking lot with the other fans. And because they had an awesome concert after the stage was over. 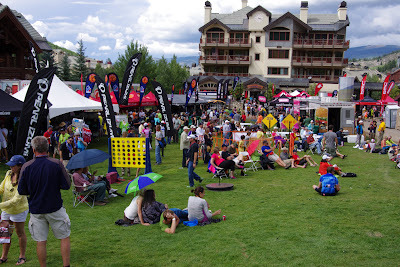 The festival village was on grass in a nice setting at the base of the ski slope, plus anyone who was interested could see the podium presentation in plain view. 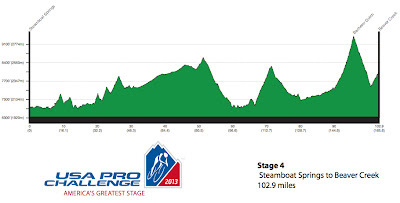 Stage 4 is being called the Queen stage of this year's tour (also known as the big daddy stage) because it truly is the sole mountain top finish unless you want to count the individual time trial up Vail Pass the following day. 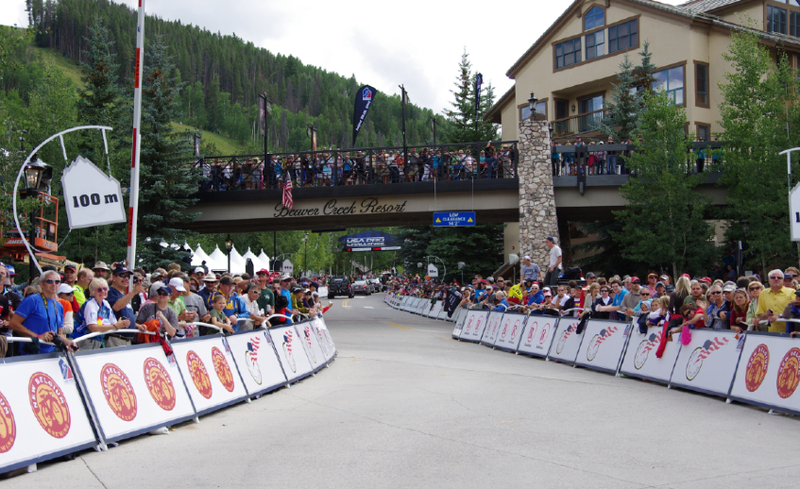 The finish of this stage is at the top of Beaver Creek just past the Sky Way bridge over Village Road. After nearly reaching the area once, the riders will descend only to climb back up to the top. It looks hard. Just look at all those fans waiting for Jens (and the other hundred or so riders) to arrive. The day at the race in Beaver Creek truly felt like a special event last year. This year the town has more in store for spectators, read more at: Official local Beaver Creek Website for the USA Pro Challenge Stage 4 - 2013. 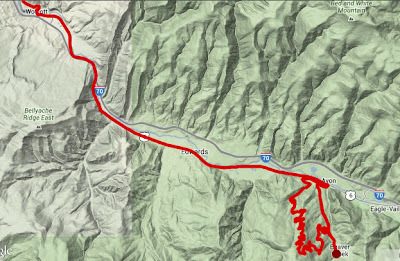 The route of Stage 4 departs Steamboat Springs at 11:00am and heads south on highway 131 through McCoy connecting with the frontage road SH 6 at Wolcott. The riders head east through the city of Edwards to reach the base of the climb at Avon. As expected the climbers ascend Village Rd, but before reaching the base of the Beaver Creek Ski Resort, the peloton will make a hard right turn onto South Holden Rd. From there they climb - Borders Rd. - Strawberry Park Rd. - Day Break Ridge. What follows next is a twisty descent into Bachelor Gulch reaching the bottom at Prater Rd and climbing all the way back up Village Road a second time, this time all the way to the finish line at the top. 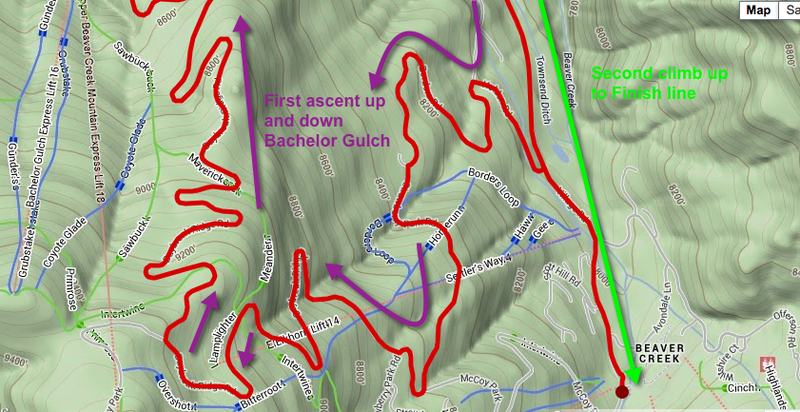 The new climb of Bachelor Gulch is so steep it has a name - "The Brink." As in ... the brink of nowhere ... I am not sure, but I am told, this brink of civilization has an average slope of 10.3% and exceeds a 20% grade in sections. This climb is so appealing I plan to go ride it myself on my way to Aspen next week. I just gotta remember what 18% feels like. 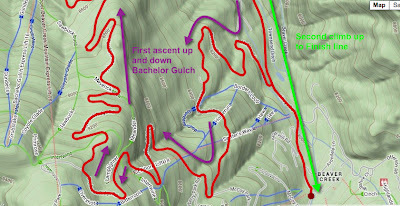 Right turn near the top of the climb will place the riders into Bachelor Gulch to descend back down to the bottom. Map by Pedal dancer. See the riders twice along this stretch of Village Rd. Map by Pedal dancer. 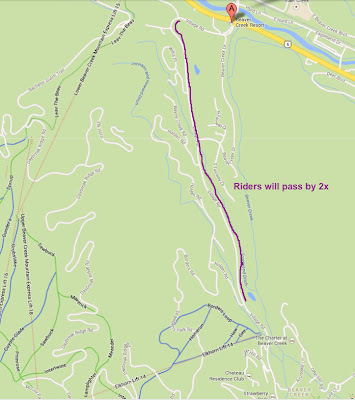 You will be able to see the riders pass by twice on Stage 4 if you are on Village Road between Prater Rd and S. Holden Rd. Spectators will be allowed at all points along this road (please respect private property). 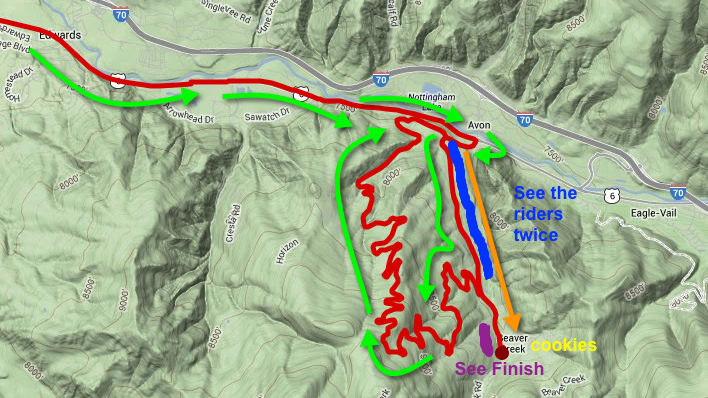 Map of loop at top of Beaver Creek, Stage 4, USA Pro Challenge. Map by Pedal dancer. Official Comments: Stage 4 is the Queen Stage of the 2013 USA Pro Challenge. It features some previously used terrain, but with some added spice. 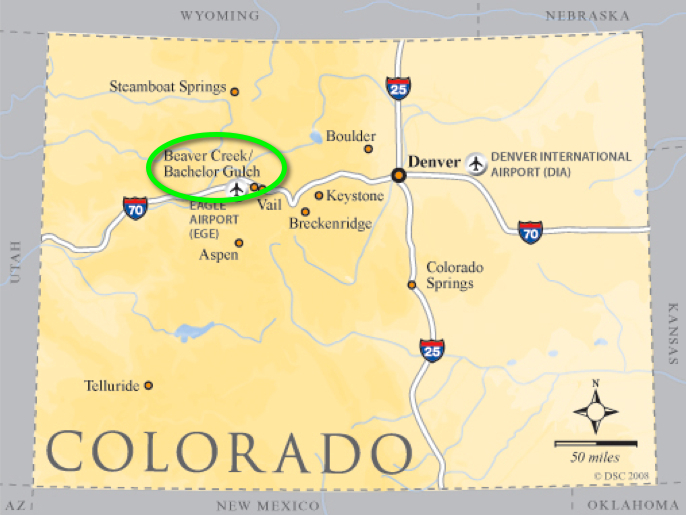 One thing is for sure, the road to the final podium in Denver goes straight over Bachelor Gulch. A new start in Steamboat will send the race off onto new country roads around Routt County. 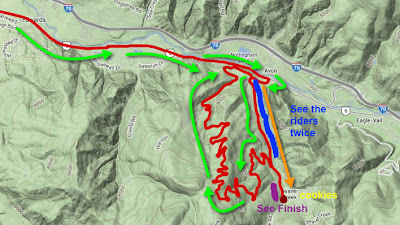 This roller coaster of small hills gives way to a gentle route south until the racers have to climb up from the river bottom at State Bridge. 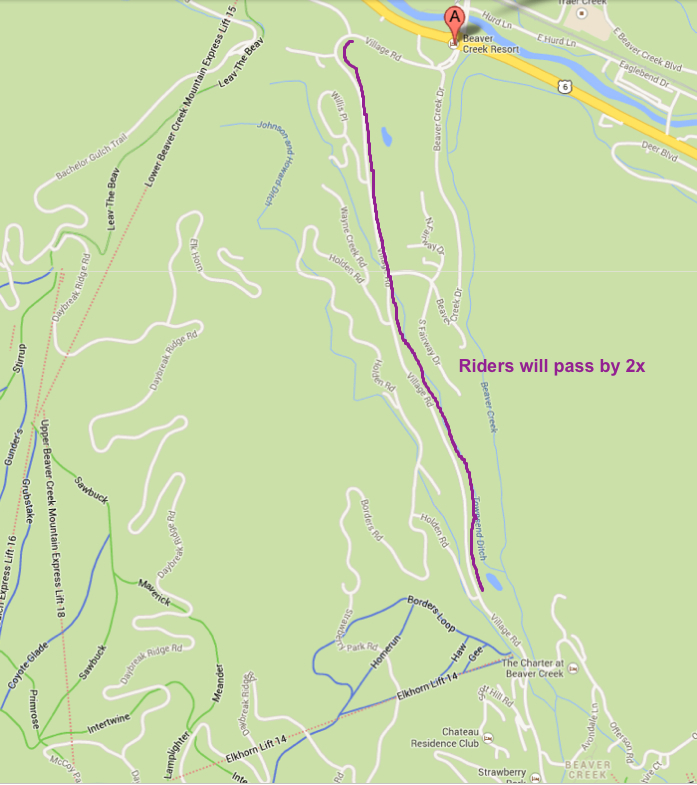 That’s just the beginning, as the new approach to Beaver Creek will now send the racers up the new climb of Bachelor Gulch. It may not be the longest or most well-known climb, but it is quite possibly the toughest. The relentless grade with pitches up to 18 percent will do real damage and create the sort of epic racing for which the Pro Challenge is known. After Bachelor Gulch, the leaders still have to race down a technical descent and power up the final 2 km climb to Beaver Creek Village. By that time the winner may not even have the strength left for a victory salute. Pedal Dancer® comments: Expect big changes on this day. Lots of race viewing options for fans, with a new varied course profile likely to spread the riders out creating time gaps and probably a surprise stage winner and maybe a change in the yellow jersey as well. A break will try to establish at some point by 20-miles outside of Steamboat, but it will be closely monitored. 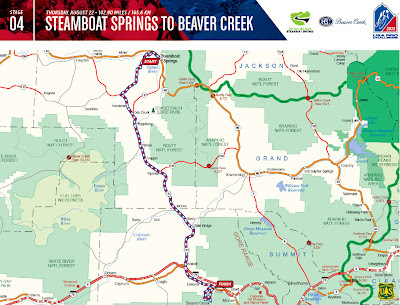 The most important aspect of this stage will be letting all riders know who is where and getting team cars and GC contenders tight in position because once the riders start the first climb up Beaver Creek they will loose sight of each other in the winding Bachelor Gulch before the second ascent and finish on this key mountain top stage. The stage winner will be smart and a good technical descender and climber. 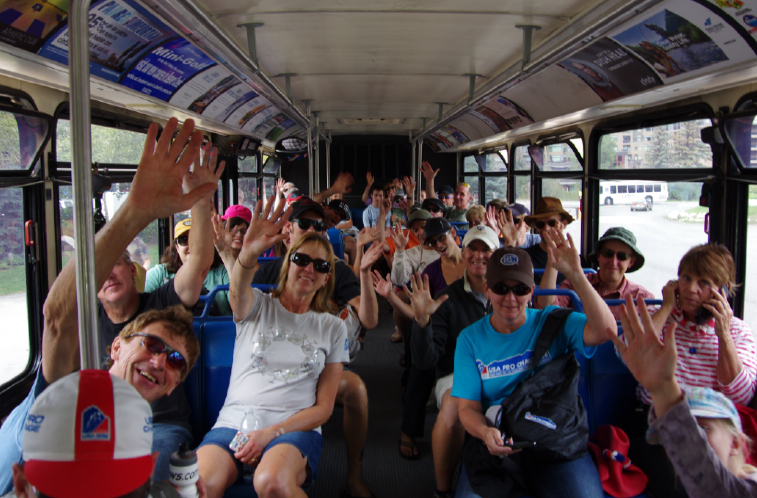 2:00 Last shuttle bus to the top of Beaver Creek - don't miss the bus! 3:00 hot cookies served up fresh! Full road closure details for Steamboat to Beaver Creek area: All Colorado Road Closures for the 2013 USA Pro Challenge Bike Race. 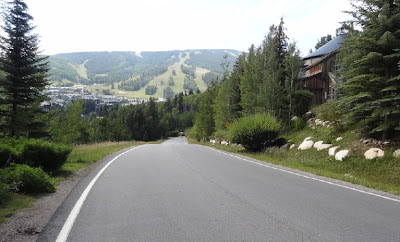 I would go straight to https://www.room77.com and look for the best deal in Beaver Creek, Avon, Edwards or Vail, Colorado, and you will be perfectly poised to enjoy Stage 5 and the Individual Time Trial up Vail Pass the next day. You can pick your place for this stage. Fans on Village Rd between Prater Rd and S. Holden Rd. 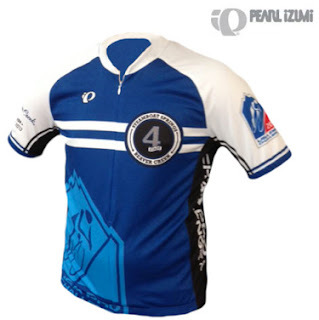 will be able to see the riders pass by on the first and second climbs. 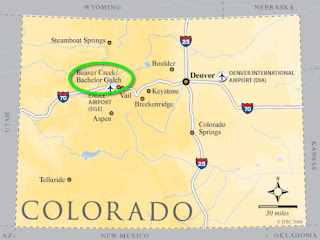 It is a 2.3 mile hike up the hill from the welcome gate to the village at Beaver Creek. There is a very nice bike path that parallels the road all the way to the Village. You can walk or ride (slowly). Also the road to Bachelor Gulch is typically gated, so this is an opportunity to ride your bike on a wickedly steep climb in Colorado. There are humungous gorgeous homes in the neighborhood. You could easily hop a shuttle bus to the top, visit the Festival, grab a cold drink and walk back down the road a bit to watch the riders. The steepest part seemed to be below the turnoff to South Hoilden Rd. 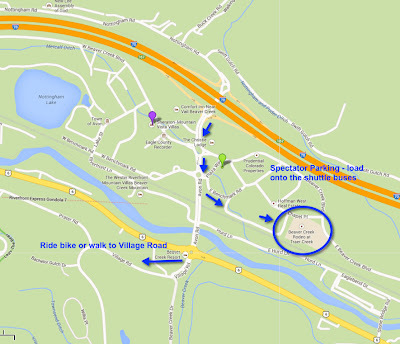 you can then walk to the base on your own accord after the race without waiting for the shuttle bus service to resume. Descending a mountain climb on race day is always festive. Fans in Beaver Creek Village proper will be able to enjoy the Festival Village, music, shops, coffee shops (Yeti's Grind or Loaded Joe's), and see the final meters of the finish. Locate the awards stage to watch the podium presentations after the stage (usually 15-20 minutes after the riders complete the stage). Beaver Creek is a very easy location to watch this ceremony which we typically only see on TV. The set-up in Beaver Creek makes getting around the course slightly awkward for fans, so figure out where everything is located and where you want to be on the barricades, to watch the race, by coming early. 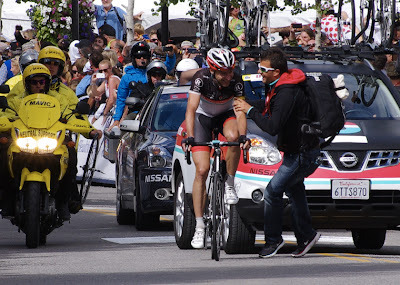 Last year it felt like I was placed on the ground about 1/2 mile behind the finish line (because there is a very curious pecking order to Photo Media), but I still managed to get this shot of Jens Voigt taking the stage win (by zooming in 200 times). Enjoy the day, buy your tshirts in the large festival area, and don't forget warm cookies at 3:00pm! 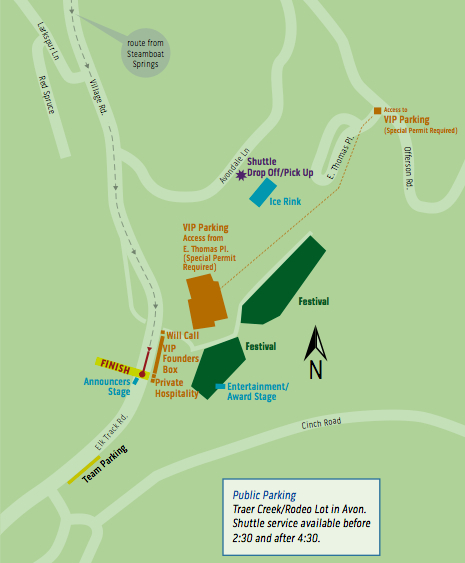 "There will be no in-resort parking in Beaver Creek Thursday, Aug. 22. Public parking for all bike race spectators will be available in the Traer Creek/Rodeo Lot in Avon and the Bear Lot at the base of the resort, with complimentary shuttles provided to bring guests to the base village"
"Complimentary shuttle service will run 7AM until 2PM prior to the race finish, and resume normal operation at approx. 4:30pm when all racers complete the stage. 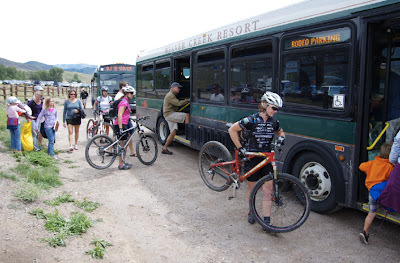 Dedicated shuttles will be running to the Vilar Performing Arts Center from the various parking locations: Bear Lot, Elk Lot, and the Rodeo/Trare Creek Lot." 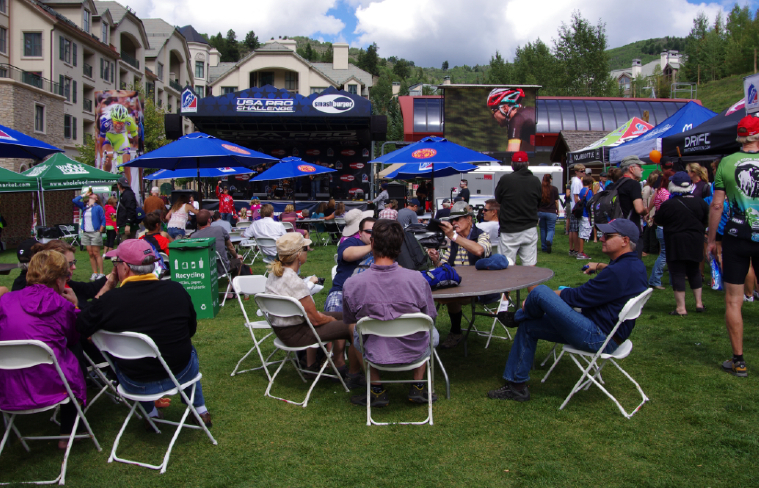 "A bike valet will be available at Creekside Park, located on the north side of Beaver Creek Village, providing a secure location for spectators to leave their bikes while enjoying the race and many activities in Beaver Creek. 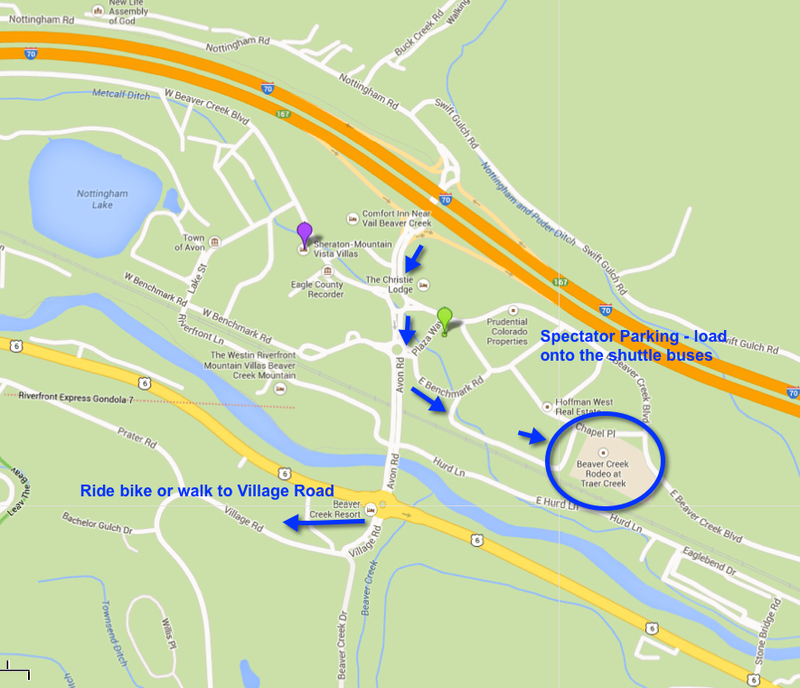 The bike valet will open at 11AM and all bikes should be picked up no later than 6PM."